Konzertgitarre, Linkshänder-Version, Zederndecke, Sapele Boden und Zargen, schwarz The CC-10L-BK (lefthanded) by Salvador Cortez is a very decent and affordable entry-level guitar for orienting and beginning guitarists. The CC-10 has a distinctive sound and has a very neat and durable finish. 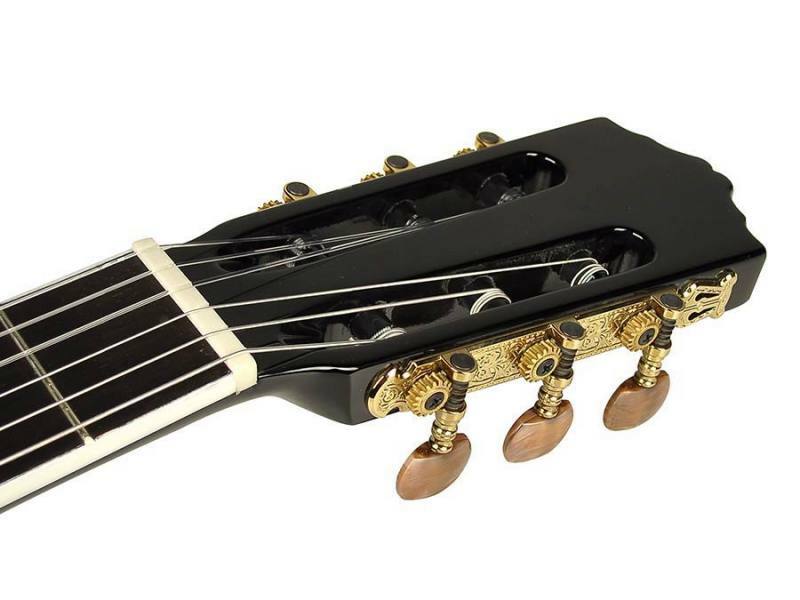 The CC-10 falls into the category of classical guitars with nylon strings that are easier to play for beginning guitarists than the steel strings of eg western guitars.The playability is guaranteed by the presence of an adjustable truss rod. Your dealer can ensure the perfect string height during regular maintenance in minutes. A truss rod is increasingly present in the higher price range of classical guitars, but at Salvador Cortez guitars it's a standard feature.